We have big plans for this park. The first phase of the Rail Park is complete and open to the public. But Phase One is just the beginning. Our plans for the Rail Park reach across three miles of unused rail lines, connecting 10 neighborhoods and 50 city blocks. This greenway will be filled with pathways and open spaces and all kinds of programming that will serve Philadelphians and visitors alike. has been raised to date by the Center City District Foundation. 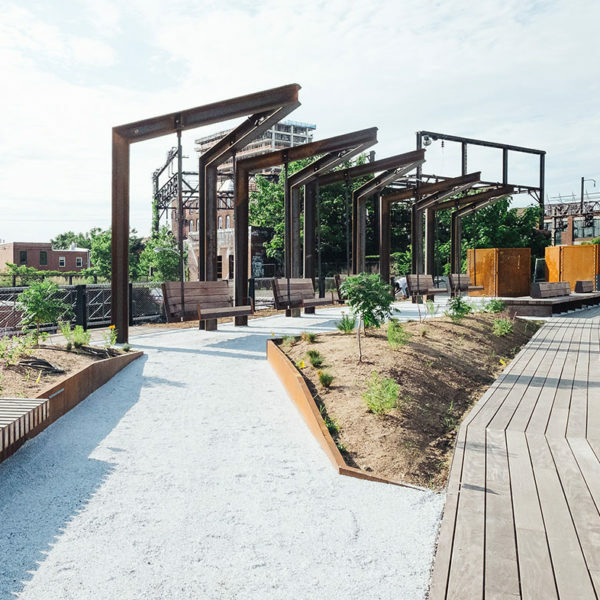 The Rail Park has support from the City of Philadelphia, the Commonwealth of Pennsylvania, the Center City District, the William Penn Foundation, the Knight Foundation, Poor Richard’s Charitable Trust, the McLean Foundation, and others. Phase One of the park is free and open to the public. There are two entrances: one on Noble Street just east of Broad, near the bridge over 13th, and the other on Callowhill between 11th and 12th. We hope you come visit, relax on the swings, enjoy the views, meet some new people, and get a breath of fresh air. Designs for Phase One were done by Studio Bryan Hanes and Urban Engineers. The construction restored and maintained much of the existing infrastructure, and carried the industrial scale and character of the site through to platforms, benches, and guardrails throughout the park. Environmental graphics were done by Cloud Gehshan. Construction funds were raised by our partners at the Center City District Foundation. The Viaduct is an elevated section of unused rail line that reaches from the site of Phase One down to Vine Street, then arcs back northward and east toward Fairmount Ave. When complete, this wide, wending section of the park will overlooks city streets and offer incredible skyline views. The Cut is an open air section of land that runs below street level, connecting the Viaduct to the Tunnel. It runs from North Broad Street near the old Inquirer Building to behind the Rodin Museum, where 22nd St meets Pennsylvania Ave. It’s lined with 30’ high stone walls and crossed by a series of bridges that support the city’s north and south bound streets. The Tunnel is a wide, beautiful space extending 3,000 feet underneath Pennsylvania Ave from 22nd to 27th Streets. Open air shafts in the streetscape above illuminate the space with natural light, while the high stone walls and vaulted brick ceilings reach 25 ft high.